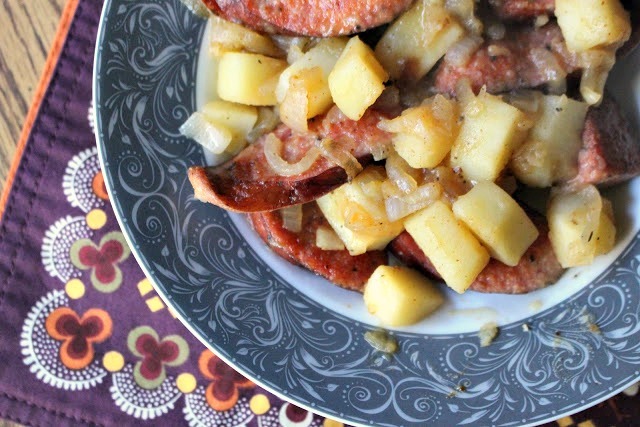 Sausage and potatoes. My husband and I recently had a lively debate about the meaning of the term "cold snap." He thought it referred to the arrival of spring, when the chilly weather was snapped and the warmth began. In my mind, it referred to a stint of cold temperatures in the middle of warm times. We agreed to disagree since both explanations made sense. Regardless of the real meaning, it was COLD last week. We got downright spoiled by the 70-degree days and were definitely not mentally prepared for the return of freezing temperatures. That said, we've been in need of some hearty, savory comfort food, and this skillet of sausage and potatoes fits the bill. It's a little bit more sophisticated than my sausage and peppers thanks to the addition of a sweet and sour sauce at the end. The presence of potatoes also makes it more filling and stick-to-your-ribs. Perhaps our personal definition of "cold snap" is weather that's so chilling, you need to break out the special sausage with the snappy casing just to find comfort and warmth. Slice the sausage on a diagonal and place the pieces in a large skillet over medium high heat and brown on all sides; this should take 8-10 minutes. Remove the sausage to a plate and wipe most of the fat from the skillet, but leave a little to cook the veggies. Add the potatoes and onions to the skillet and season with the herbs, salt, and pepper. Saute 10 minutes or so, until the potatoes are browned and tender and the onions are softened. Add the sausage back to the skillet. Combine the brown sugar, vinegar, and mustard and add to the skillet, stirring to coat. Simmer uncovered for 3-5 minutes, until the sausage is heated through. Oh! This is a kind of dish that I would love to have now...simple and so tasty! Indeed comforting! Simple, satisfying and filled with comfort. That's what this dish is all about on a chilly evening. As far as cold snaps go, my definition is the same as yours! I am completely intrigued by your pecan smoked sausage. Your sauce sounds like a delicious way to pull this dish together.